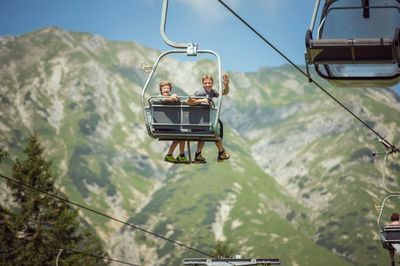 The Alpine Coaster in Hoch-Imst delights guests and visitors of all ages as a family-friendly destination. After the first ride on Tyrol's most spectacular summer toboggan run, it becomes clear: "YOU too will be off on it!" Already for 10 years excited, up in Hoch-Imst, the route of the longest summer toboggan run in Tyrol, yes, the longest Alpine roller coaster in the world, the Alpine Coaster ... However, this is not for the faint hearted! The motto of the Alpine Coaster in Imst is: Think big and fast! Over hill and dale, you slide down the rails in the sledge - all 3.5 kilometers long, over waves, steep curves and jumps, in places up to 6 meters above the ground. The action and nature spectacle is just right for children and children's heads who like to call "Once more!" At the finish. Free long-term parking lot at the Imster-Bergbahnen!